The determinant is a real number related with each and every square matrix. There is even a definition of determinant which defines it in terms of itself. The determinant of a square matrix A is represented by ‘det A’ or |A|. Now, that last one looks similar to the absolute value of A, however you will have to apply the context. When the vertical lines are around a matrix, it signifies determinant. The determinant of a 2×2 matrix is found much similar to a pivot operation. This is the product of elements on the main diagonal minus the product of elements off the main diagonal. a) Determinant is a real number and is not a matrix. b) Determinant can be a negative number. c) It is not related with absolute value at all apart from that they both employ vertical lines. d) The determinant just exists for the square matrices (2×2, 3×3,.... n×n). The determinant of 1×1 matrix is that single value in determinant. e) The inverse of a matrix will present only when the determinant is not zero. The definition of determinant which we have so far is just for a 2×2 matrix. There is a shortcut for 3×3 matrix; however it is believed that you must learn the way that will work for all the sizes, not merely a special case for a 3×3 matrix. The method is termed as expansion by using minors and cofactors. Before we can utilize them, we require defining them. The minor for any element is the determinant which outcomes whenever the row and column element are deleted. The notation Mij is employed to stand for the minor of element in row i and column j. Therefore M21 would mean the minor for the element in row 2 and column 1. Let consider the 3×3 determinant which is shown below. Now we're going to find out some of the minors. The minor is a determinant which remains whenever you delete the row and column of the element you are trying to find out the minor for. That signifies we should delete row 2 and column 1 and then determine the determinant. Since you can see, the minor for row 2 and column 1 is M21 = -4. Let us try the other one. This time, we would now delete row 3 and column 2. Therefore the minor for row 3, column 2 is M32 = -5. If you are just trying to determine the determinant of a matrix, this is overkill. However there is one very useful application for it and it will provide us practice finding minors. Matrix of minors is the square matrix where each and every element is the minor for the number in that place. Here is a generic matrix of the minors for a 3×3 determinant. Let us determine the matrix of minors for our original determinant. Here is determinant. Here is the work to determine each and every minor in the matrix of minors. Finally, there is matrix of minors. Again, you do not need to place the labels for the row and columns on there, however it might help you. The cofactor for any element is either the minor or opposite of the minor, based on where the element is in original determinant. When the row and column of the element add up to be even number, then the cofactor is similar as the minor. When the row and column of the element add to be an odd number, then the cofactor is opposite of the minor. Instead of adding up the column and row of the element to see whether it is even or odd, most of the people prefer to utilize a sign chart. The sign chart is either a + or - for each and every element in the matrix. The first element (row 1, column 1) is always a + and it exchanges from there. Note: The + doesn’t mean positive and negative. The + signifies the similar sign as the minor and the - signifies the opposite of the minor. Think of it addition and subtraction instead of positive or negative. Again, if we are trying to do is finding the determinant; you do not require to go via this much work. The matrix of cofactors is matrix found by substituting each and every element of a matrix by its cofactor. This is the matrix of minors with signs modified on the elements in the positions. Here are some steps to go via to determine the determinant. a) Pick any row or column in the matrix. It doesn’t matter which row or which column you utilize, the answer will be similar for any row. There are some columns or rows which are simpler than others; however we will get to that later. b) Multiply each and every element in that row or column by its cofactor and add up. The outcome is the determinant. Let us expand our matrix all along the first row. From the sign chart, we observe that 1 is in a positive position, 3 is in negative position and 2 is in positive position. By placing the + or - in front of element, it takes care of the sign adjustment whenever going from minor to the cofactor. The determinant of this matrix is 17. Let us try it again, but this time expands on the second columns. Since an effort to save time, the minors for that column (that is, from the matrix of minors) were 2, -2 and -5. The original elements were 3, 1 and 5. The 3 and 5 are in negative places. Expand on any row or any column, we will get 17.
a) Pick row or column with most zeros in it. As each minor or cofactor is multiplied by the element in matrix, picking a row or column with lots of zeros in it signifies that you will be multiplying by a lot of zeros. Multiplying by zero does not take very long at all. However, when the element is zero, you do not need to even determine the minor or cofactor. b) Pick row or column with the biggest numbers or variables in it. Elements in the row or column which you expand all along are not used to determine the minors. The only place that they are multiplied is once, in expansion. When you pick the row or column with the lowest numbers, then each and every minor will be the product of bigger numbers. When you pick a row or column which has variables in it, then you will just have to multiply by the variables once, throughout the expansion. Turn it to a matrix of cofactors by modifying the signs on the suitable elements which is based on the sign chart. Determine the adjoint by transposing the matrix of cofactors. To transpose a matrix, we switch the rows and columns. That is, the rows become columns and the columns become rows. The Transpose of a matrix can be determine by using the TI-82 or TI-83 calculator by entering the name of matrix and then selecting Matrix, Math and then option 2, a super-scripted T, such as [A]T.
At last divide the adjoint of matrix by the determinant of matrix. In this trouble, the determinant is 17; therefore we will divide each and every element by 17. The resultant matrix is the inverse of original matrix. The inverse of a matrix is found out by dividing the adjoint of matrix by the determinant of the matrix. Do not try that on your calculator as the calculator won't let you divide a matrix by the scalar. We will have to multiply by the inverse of determinant rather. When you check it with your calculator, you can confirm that the inverse really is the adjoint divided by the determinant. As inverse is the adjoint divided by the determinant, we can observe why the inverse does not exist when the determinant is zero. That would cause division by zero that is undefined. Pick row or column with the most zeros in it. In this situation, that is the second column. For each and every element in the original matrix, its minor will be 3×3 determinant. We will have to expand each of such by employing three 2×2 determinants. This is why we wish to expand all along the second column. The minors are then multiplied by their elements, thus if the element in the original matrix is 0, it does not really matter what the minor is and we can save a lot of time by not having to recognize it. In second column, you won't require to find two of the minors as their corresponding element in the second column are zero. We could really fill in such middle two minors, however as they are multiplied by 0, it does not really matter what they are. However, you could just as simply skip them. Now, there are two 3x3 determinants left to determine. 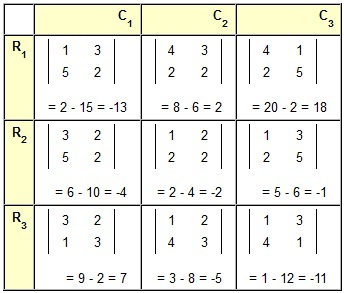 In first 3x3 determinants, there are no zeros, therefore pick the row or column with the greatest numbers. That would be column 1, therefore expand all along the first column. Note that the 4 is in a positive place. The sign charts start over with each and every new determinant. The place of the number in original matrix doesn’t matter, only its place in the current matrix. Let consider the other 3×3 matrix. In this one, there is a 0 in row 1 and column 2. Either one of such would be a good pick for the expansion, however as row 1 has slightly bigger numbers; we will expand all along the first row. Whenever you go to find out the determinant, keep in mind that there were elements from the original 4×4 matrix that were times each of such 3×3 determinants. First one was -2 and the second one was +2. To determine a 3x3 determinant with no zeros, you have to determine three 2x2 determinants. To determine a 4x4 determinant with no zeros, you have to determine four 3x3 determinants, each of which then becomes the three 2x2 determinants for a net of twelve 2x2 determinants. To determine a 5x5 determinant with no zeros, you have to determine five 4x4 determinants, each of which then becomes four 3x3 determinants, and each of such becoming three 2x2 determinants for a net of sixty 2x2 determinants. After the last problem, you have got to be asking yourself if there is not a simpler way. Well, yes, there is, as long as the determinant does not have any variables in it. You can employ the calculator. The notation that TI-82 or TI-83 calculator employs is the Det A notation. Therefore after entering the matrix to one of the available matrices on the calculator, enter DET by going Matrix, Math and selecting option 1. Then put in the name of matrix that you are using. You do not need to use the parentheses (unless you encompass a TI-83), however you can when you want to determine the determinant of a product ‘det ([A]*[B])’ or the determinant of a transpose ‘det ([A]T)’ as opposed to the transpose of determinant ‘(det [A])T’. By the way, the calculator won't determine the transpose of a determinant as the determinant is scalar (real number) and the calculator only knows how to determine the transpose of a matrix. The transpose of scalar is that scalar. We are really going to like determining the determinants of such matrices. It is a matrix in which all non-zero elements are either on or above the main diagonal. That is, all non-zero values are in upper triangle. Everything beneath the diagonal is a zero. It is a matrix in which all the non-zero elements are either on or beneath the main diagonal. That is, all non-zero values are in the lower triangle. Everything over the diagonal is zero. It is a matrix in which all the non-zero elements are on main diagonal. Everything off the main diagonal is zero. The determinant of a triangular matrix or diagonal matrix is the product of elements on the main diagonal. There were three elementary row operations which could be executed and that would return an equivalent system. With determinants, as the determinant of a transpose is similar as the determinant of the matrix, the elementary row operations can as well be applied to columns. By executing row-reduction (employing pivoting on a 1 if you like), you can put a matrix to triangular form. Once it is in triangular form, then all you have to do is to multiply the elements on main diagonal and you encompass the determinant. Let us look at each and every three elementary row operations. a) When you interchange two rows or two columns in a determinant, then the resultant determinant will vary only in sign. That is, when you swap rows or columns, then the resultant determinant is the opposite of original determinant. b) When you multiply a row or column by a non-zero constant, then the determinant is multiplied by that similar non-zero constant. c) When you multiply a row or column by a non-zero constant and add it to the other row or column, substituting that row or column, there is no modification in the determinant. The last operation is equal to pivoting on a one! Note: When your pivot is a number other than one, then you are multiplying each and every row that you modify by the pivot element. Therefore, when you pivot on 3 and you modify two rows, then the resultant determinant will be 3*3 = 9 times as big as the original determinant. We do not have to put the matrix to reduced row-echelon form or even row-echelon form. We are free to stop the reduction at any point and expand by using minors and cofactors. Pivot is suggested where there is a one, and then expands. a) The entire row is zero. b) Two rows or columns are equivalent. c) The row or column is a constant multiple of the other row or column. Keep in mind, that a matrix is invertible, non-singular, if and only if the determinant is not zero. Therefore, when the determinant is zero, then the matrix is singular and doesn’t have an inverse.